Click the image to watch the performance! RECONNECTING is a programmatic composition that tells the story of participants in a unique rehabilitation program for juvenile and adult offenders with mental illness or substance abuse issues. The Treatment Court of the Delaware County Juvenile Court, Delaware County Municipal Mental Health Docket, and Maryhaven Treatment Center are designed to help participants gain control over their illness or addiction, to take responsibility for both their offense and their personal development, and to reconnect as healthier individuals to their families and community. 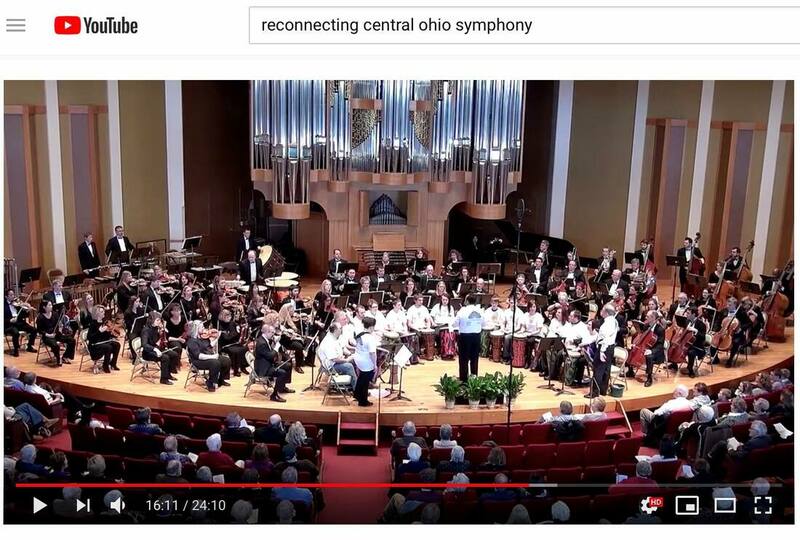 The Central Ohio Symphony's Reconnecting program developed the groundbreaking therapeutic drum circles for all three of these programs. I traveled several times to Delaware to conduct research for the composition. I attended juvenile and adult court hearings and met with the program’s support team comprised of the Magistrate, Probation Officer, Therapist, and Treatment Services Department Head. This allowed me to gain valuable knowledge of the program and see firsthand the efforts taking place to help rehabilitate the offenders. I also attended a drum circle session and was able to speak directly with the participants about their experiences in the program, as well as witness the type of drumming techniques they were learning. From these discussions and observations I created the structure for RECONNECTING, which is built on the progression of the participants though the court program: their initial Offense, three rehabilitation phases, Graduation, and the Future.